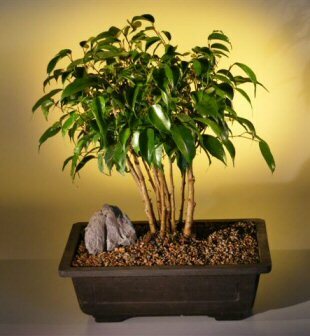 The other day I saw an old man selling bonsais on the side of the road, and as a person that's always wanted one, I purchased. The old man spoke very little English, but did inform me to water my tree every two days, and that is all the information I have. Any help is appreciated!! Re: Help Identify My Bonsai!! I think your trees are ficus (though I have to say, the last time I said that I was wrong, so others can check me). I don't really recommend buying bonsai from people selling them by the side of the road. They are notoriously unreliable and have no reputation to protect, and will not be there when you want to ask questions. You don't really have bonsai at this point, you have tree seedlings in pots with some bonsai potential. Bonsai is the art of growing and shaping trees so that they have the appearance of mature trees miniaturized. Your trees have had no art and no shaping. It doesn't really look like bonsai soil, though can be hard to tell from the picture. Bonsai soil is mostly inorganic, very loose, gritty, and free draining. If yours is more like potting soil, it will need to be changed, but in the spring is the time to do that. It looks like the small leaf ficus. At this point I'd call it a potted plant. It looks like the person transplanted it from a 3 inch round pot into that decorative pot. The soil is really not bonsai soil so becareful not to over water it. Ficus will want to be outside as much as possible. It notoriously hates to have its light changed. If it isn't bright enough or you go from high light to low light all of the leaves will fall off and it will have to grow new ones back.